Breakfast at 5.30 am and I had the feeling I was chewing porridge and tried to get it down through my throat by drinking coffee. Started the warm up at 6.45 and was standing at the start line half an hour later. 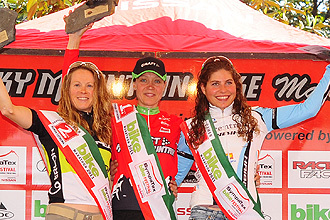 Riva del Garda MTB marathon. The season has started with105km and 3600 meters of climbing. InItalythe weather is supposed to be sunny and warm. This year we had some rain in the night before the race and this made the course very slippery, especially the down hills. The start is always a bit chaotic with several hundred riders fighting for a good position into the first climb. The first climb is so narrow that it is nearly impossible to pass anyone and there is always someone taking risks to be as far up in the front as possible. Luckily I saw no crashes, was not involved in any and was making the top women trio withBritain’s Sally Bigham andGermany’s Elisabeth Brandau up the first climb. Very soon I noticed Elisabeth could not follow. Sally was in the group for some kilometres and I noticed suddenly I was the leading woman. I continued the steady pace for the rest of the race. Sometimes I was riding alone, sometimes I caught a group and could take advantage of that. Mountainbike marathons are sometimes like very long time trials. Sometimes you are fighting more against yourself than against other riders. It is all about staying focused for a very long time. I had no super feeling, but I won the race. The speed and good feeling will also come with the time.